Last weekend, the cabins for Christmas market were being put in place along the east end of avenue des Champs-Élysées. At the same time, city workers on mini cranes were busy hanging up light fixtures to decorate the trees lining side by side to the cabins. With the temperature dialing in low at 2-4 °C, there is a certain excitement for the winter celebration to come. 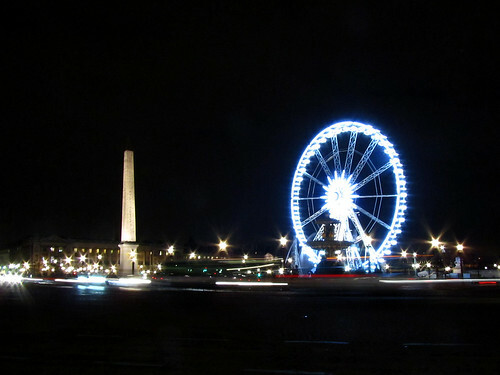 Today, a mere few days later, I am seeing a huge Ferris wheel sitting prettily on Place de la Concorde. That caught me by surprised. For some reason, I had it in my head that the Ferris wheel is usually not erected until December, and it’ll be there for about 4-5 weeks. Guess I’m wrong. It’s there now, and they’ll start operating tomorrow until 19 February 2012. A whooping 3 months instead of about one! The Christmas market at Champs-Élysées itself will be following suit on Saturday 19th, through to 2 January 2012. And for those looking forward to Christmas illuminations of Champs-Élysées in general, don’t forget, Audrey Tautou will be switching on the lights on Wednesday, 23 November, at 6.30pm, in front of l’Atelier Renault. indeed. it’s a money-making spinner!